Sun shades for playgrounds, such as stand-alone canopies or tensioned sail structures, are ideal for areas that regularly entertain people. Children are especially susceptible to the negative effects of the sun’s UV (ultraviolet) rays, but adults need protection as well. The playground canopy covers are free-standing structures supported by four or more durable steel posts covered with specialty shade cloth such as Comtex or Monotec. The sun shade fabric used blocks 95% of the sun’s harmful rays and comes in an assortment of colors ready to compliment any park or existing building. A shade structure allows children to play without getting sunburned or made uncomfortable by the heat. The playground canopy keeps temperatures cooler and invites children to play in a protected environment. Playground and park shade canopies are ideal for schools, parks, recreation centers, museums, zoos, water parks, dog parks and daycare centers. Each playground canopy is custom manufactured to your exact specifications. We offer Monotech canopies with spans up to 100′ and Comtex sails with spans up to 50′. Frames are custom-welded from commercial-grade steel and powdercoat painted in the color of your choice. Shade cloth comes in nearly a dozen different colors. If you choose to install a tension sail structure, you can mix-and-match different colors for a fun, catchy look. 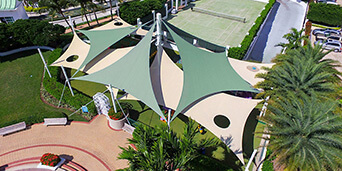 ShadeFLA has installed playground canopies at schools, pools, parks, pet boarding centers, and museums throughout the South Florida region.